The Honey Buzzard is a widespread but rare British breeding bird with, perhaps, about 50 pairs nesting in the country each year with, usually, one or two pairs breeding in Nottinghamshire in the 'Forest Country'. Although they will eat what we would expect of large birds of prey - including mammals, birds and reptiles - their main prey consists of wasp and bee adults, pupae and larvae. In the autumn there may be frequent sightings of this species in the eastern counties of Britain when birds from north-eastern Europe pass through on their migration to Africa. Unlike ordinary Buzzards, to which they are no more closely related than they are to any other British bird of prey, Honey Buzzards are forced to migrate for their main prey items are either dead or inactive during the winter. The main hunting technique of the species is to locate a bee or wasp in flight and follow it back to its nest. There, the bird can excavate the nest to eat the nutritious larvae and pupae. 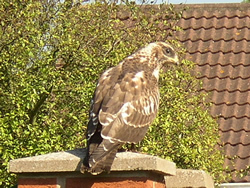 On 18th September 2008, several Beckingham residents were privileged to enjoy prolonged, close views of a Honey Buzzard which located a wasp nest in a compost heap in a garden. It spent most of the day - from mid-morning until mid-afternoon working at the heap, apparently unconcerned about the swarm of angry adult wasps flying all around it. Adaptations against stings from bees and wasps include small, scale-like feathers around the head and cheeks and, possibly, some natural immunity to bee and wasp venom. From its plumage features and lack of fear of human beings, this was clearly a juvenile bird and it was even kind enough to pose on the garden wall a few times to give a clear view and photography opportunities. Sadly this lack of fear of humans, which now allows the bird to exploit even wasps nests so close to human habitation, can lead to premature death as it migrates through Mediterranean countries within the range of hunters' firearms. By late afternoon it had left the wasp nest even though it had not been completely destroyed. Perhaps that was to leave enough food for another day. Whether this bird was one of our own locally produced birds or one refuelling during its migration from Europe we may never know. 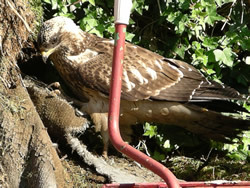 For more information on the Honey Buzzard please click here.